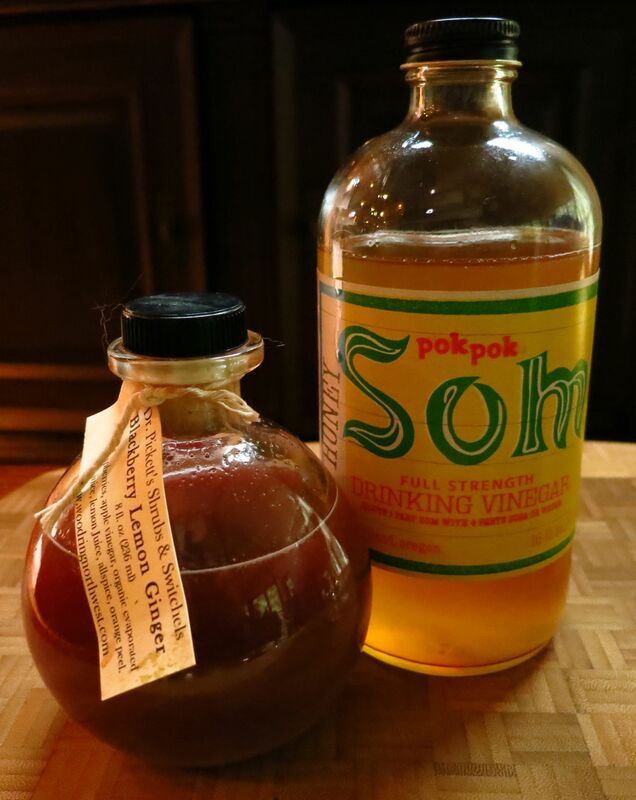 This week we decided to take a look at shrubs – flavored, sweetened vinegar-based syrups – and switchels, which are the same thing only with the inclusion of ginger as a flavoring. 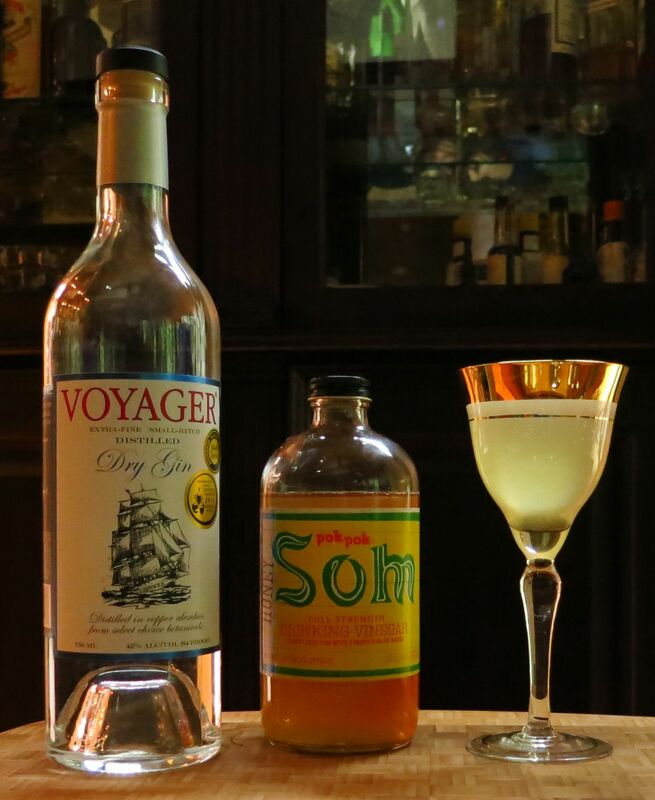 The vinegar in them serves the same role as citrus to provide acidity, interest, and balance to a cocktail. Drinking vinegar sounds offbeat, right? But they’re actually very tasty and make it easy to whip up a nuanced drink with just a few ingredients. 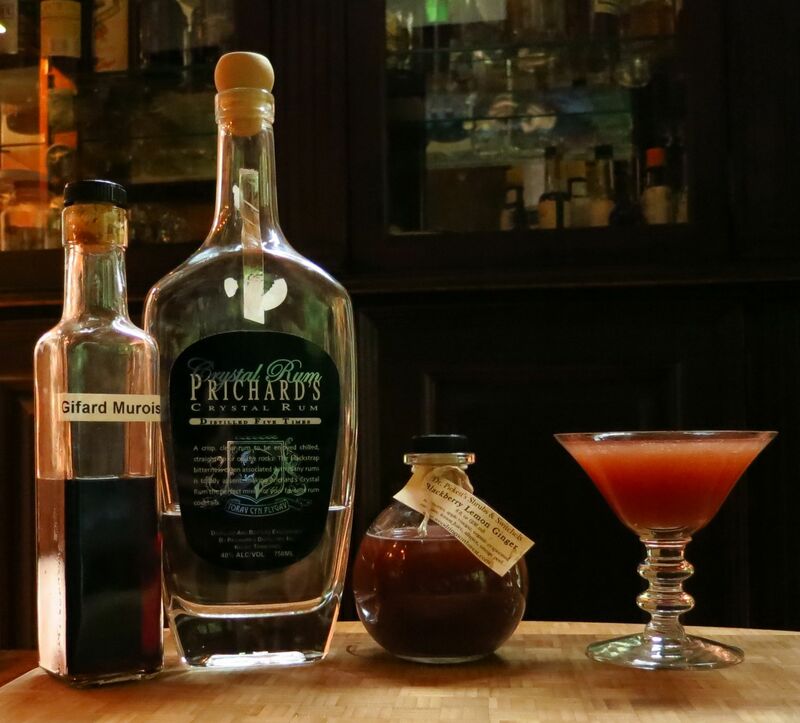 We decided to experiment with one shrub and one switchel. What we found when trying them with different spirits and other mixers is that they do best with only a couple of other ingredients, in that they typically have fairly complex sweet-sour (and sometimes salty as well) flavors that don’t need a lot else going on in order to shine. This is a great help when you want to mix up something tasty without mucking about with too many ingredients. Shake the first two ingredients with ice. Strain into a glass. Top with soda. Nose: Honey, vinegar, then botanicals of the gin; juniper, coriander, and lemon. Rather nice despite the fact that it sounds unorthodox. Palate: Salty honey on the front, balanced out by sour tanginess from the vinegar. Same gin botanicals from the nose on the mid-palate, with the juniper coming to the fore. Strong sweet/sour/salty flavors balancing each other, with the honey being a constant presence throughout. Shake with ice, strain into a glass. Garnish with a lemon twist. Nose: Vinegar, blackberry, and ginger, then sugary tropical fruit notes from the rum. Palate: Sweet and sour blackberry to start followed by a big hit of ginger. Very sweet tropical fruit at the mid-palate that gives way into a warm ginger finish. Instead of being integrated to the point where flavors blend like some drinks do, this one lets each ingredient speak up at its own time. Quite tasty! Since shrubs and switchels are often made by smaller craft producers and can vary quite a bit in terms of sweet/tart/salty flavors, we recommend that you taste these recipes if you make them with different product than we did so you can amend them as necessary. The sweet-sour tanginess that these drinks offer would also make them excellent candidates for mixing in the glass and serving on the rocks during warmer weather. Whatever season were in, they are well worth giving a try as an interesting alternative to citrus-based drinks. *Their shrubs and switchels aren’t available at their site; we bought ours from them at a farmers market. But they do have a contact number on their site, so if you live in the Pacific NW you can give them a call and see if they are available anywhere near you. This entry was posted in blackberry liqueur, gin, Original Cocktail, shrub, switchel, white rum and tagged as above so below cocktail recipe, brave sir robin cocktail recipe, dr picketts lemon ginger blackberry switchel, giffard muroise, Pacific Distillery Voyager Gin, pok pok som honey shrub, prichards crystal rum. Bookmark the permalink. I like this a lot. It’s a subject I’ve been really interested in recently. Thanks for the post! Excellent! Yeah we’re definitely going to be experimenting with shrubs and switchels more. Thanks. Thanks. Our pleasure. And thanks for the extra legwork!